Wanderer above the Sea of Fog (German: Der Wanderer über dem Nebelmeer), also known as Wanderer above the Mist or Mountaineer in a Misty Landscape, is an oil painting c. 1818 by the German Romantic artist Caspar David Friedrich. It has been considered one of the masterpieces of Romanticism and one of its most representative works. It currently resides in the Kunsthalle Hamburg in Hamburg, Germany. In the foreground, a young man stands upon a rocky precipice with his back to the viewer. He is wrapped in a dark green overcoat, and grips a walking stick in his right hand. His hair caught in a wind, the wanderer gazes out on a landscape covered in a thick sea of fog. In the middle ground, several other ridges, perhaps not unlike the ones the wanderer himself stands upon, jut out from the mass. Through the wreaths of fog, forests of trees can be perceived atop these escarpments. In the far distance, faded mountains rise in the left, gently leveling off into lowland plains in the east. Beyond here, the pervading fog stretches out indefinitely, eventually commingling with the horizon and becoming indistinguishable from the cloud-filled sky. The painting is composed of various elements from the Elbe Sandstone Mountains in Saxony and Bohemia, sketched in the field but in accordance with his usual practice, rearranged by Friedrich himself in the studio for the painting. In the background to the right is the Zirkelstein. The mountain in the background to the left could be either the Rosenberg or the Kaltenberg. The group of rocks in front of it represent the Gamrig near Rathen. The rocks on which the traveler stands are a group on the Kaiserkrone. 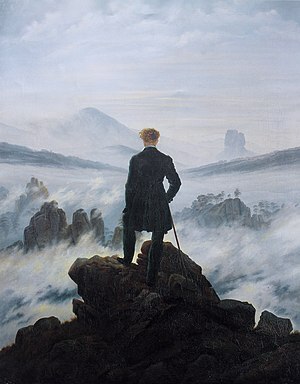 Wanderer above the Sea of Fog is true to the Romantic style and Friedrich's style in particular, being similar to other works such as Chalk Cliffs on Rügen and The Sea of Ice. Gorra's (2004) analysis was that the message conveyed by the painting is one of Kantian self-reflection, expressed through the wanderer's gazings into the murkiness of the sea of fog. Dembo (2001) sympathised, asserting that Wanderer presents a metaphor for the unknown future. Gaddis (2004) felt that the impression the wanderer's position atop the precipice and before the twisted outlook leaves "is contradictory, suggesting at once mastery over a landscape and the insignificance of the individual within it". With the composition of the figure's back placed towards the observer otherwise known as Rückenfigur, it allows the observer to gain insight into Friedrich's experience. Friedrich himself states his ideas in regards to this, "The artist should paint not only what he has in front of him but also what he sees inside himself." Some meaning of this work is lost in the translation of its title. In German, the title is "Wanderer über dem Nebelmeer". Wanderer in German can mean either "wanderer" or "hiker". Robert Macfarlane discusses the painting in terms of its significant influence on how mountain climbing has been viewed in the Western world since the Romantic era, calling it the "archetypical image of the mountain-climbing visionary", and describing its power in representing the concept that standing on mountain tops is something to be admired, an idea which barely existed in earlier centuries. ^ Arts Council of Great Britain (1959). "The romantic movement. Fifth exhibition to celebrate the tenth anniversary of the Council of Europe, 10 July to 27 September 1959, the Tate Gallery and the Arts Council Gallery, London". Hathi Trust. ^ a b c Gaddis, John Lewis (2004). "The Landscape of History". The Landscape of History: How Historians Map the Past. Oxford University Press. pp. 1–2. ISBN 0-19-517157-8. ^ a b Gorra, Michael Edward (2004). The Bells in Their Silence: Travels Through Germany. Princeton University Press. pp. 11–12. ISBN 0-691-11765-9. JSTOR j.ctt7sr5d. ^ Hoch, Karl-Ludwig (1987). Caspar David Friedrich und die böhmischen Berge. Dresden: Kohlhammer. p. 215. ISBN 9783170094062. ^ Gunderson, Jessica (2008). Romanticism. The Creative Company. p. 7. ISBN 1-58341-613-7. ^ Dembo, Ron S.; Freeman, Andrew (January 19, 2001). The Rules of Risk: A Guide for Investors. Wiley. p. 10. ISBN 0-471-40163-3. ^ “Wanderer above the Sea of Fog.” Artble, 19 July 2017, www.artble.com/artists/caspar_david_friedrich/paintings/wanderer_above_the_sea_of_fog. ^ “Wanderer Above the Sea of Fog, Caspar David Friedrich (Ca. 1817).” Scholastic Art, art.scholastic.com/pages/topics/posters/wanderer-above-the-sea-of-fog-friedrich.html. ^ Black, Joseph; Conolly, Leonard; Flint, Kate; Grundy, Isobel; LePan, Don; Liuzza, Roy; McGann, Jerome J.; Prescott, Anne Lake; Qualls, Barry V.; Waters, Claire (July 23, 2010). The Broadview Anthology of British Literature: The Age of Romanticism. 4 (2nd ed.). Broadview Press. p. 1056. ISBN 978-1-55111-404-0. ^ Macfarlane, Robert (2003). Mountains of the Mind: A History of a Fascination. Granta Books. p. 157. ISBN 9781847080394. Wikimedia Commons has media related to Der Wanderer über dem Nebelmeer.